If you missed Part 1 of this interview, don't panic! It's right here. Shana Anderson is the founder of the company, Reeve's Tees. 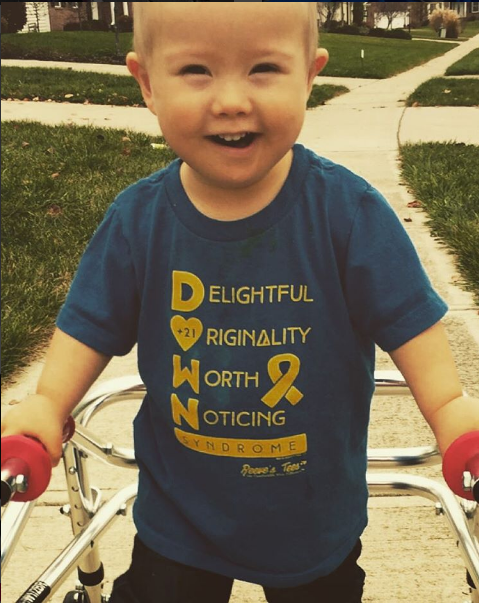 Reeve's Tees makes loving, humorous T-Shirts that celebrate children and adults with Down syndrome. What would you like to see change in the way society sees special needs children and their families? Are there are any specific policies, educational and job opportunities, or just general cultural norms that you would like to see improve? While there is still so much to change and improve, I must first say how far we have come! Every time I meet a parent who has an older child with Down syndrome, I wholeheartedly thank them. The parents who walked this path before me faced a much more difficult set of circumstances and decisions, and so many of them bravely fought for their children in a world that was a lot less accepting. In doing so, they left a much kinder, gentler world in their wake – one in which I can confidently raise a special child like Reeve today in a supportive community. I don’t have to fight for his medical care, education, or even the ability to raise him at home with our family – those things are now a given. That said – work is still being done to better integrate people with genetic conditions, physical differences, and intellectual disabilities into society. One really awesome movement that’s happening now is the fact that we are seeing more people with Down syndrome in magazines, on TV, and through social media. A big part of helping others “get comfortable with difference,” is exposing them to people who have these differences. I love the new show on A&E called “Born this Way” – it is basically a reality show featuring a group of adults who have Down syndrome. By watching this show, someone will see that people with Down syndrome have hopes and dreams, they have struggles, and most importantly, they have a lot to offer this world! Additionally, a fellow mom named Katie Driscoll started a movement called “Changing the Face of Beauty”. Her organization challenges companies to use more inclusive advertising. Because of her mission, we now see people with disabilities in all kinds of national marketing. While it provides a great opportunity for the models who have disabilities, more importantly, I believe that it helps “normalize” differences for society so they can see the beauty in this type of diversity. Another trend I see happening in the Down syndrome community revolves around increasing the opportunities available after high school. Many young people with Down syndrome would love to go to college or have jobs, but there are not always a lot of opportunities once high school ends. One of my favorite non-profit organizations is called Ruby’s Rainbow – another organization started by a fellow mom, Liz Plachta. Ruby’s Rainbow grants scholarships to adults with Down syndrome to pursue post-secondary education. I just think an opportunity like that for Reeve would be so cool. There are so many awesome things happening right now in the Down syndrome and special needs communities – too many to list. I’ve had the great fortune to meet some amazing parents and siblings who have applied their skillsets and resources to continually improve the lives of those who have Down syndrome. They are doing everything from helping doctors better deliver a Down syndrome diagnosis, to working with the 911 system on how to handle situations that involve someone with a disability, to researching targeted nutrition intervention to combat the harmful effects of the extra chromosome, to making welcome baskets for babies born with Down syndrome, to providing assistance and funding for families trying to adopt a baby with Down syndrome, and so much more... I could go on and on because the passion in the Down syndrome community is endless. While Reeve’s Tees is not a non-profit organization, we do love to support so many of these efforts, and we regularly donate a portion of all of our profits to various Down syndrome organizations. Could you talk a bit about what it’s like to run this amazing business while taking care of three beautiful kids? What advice do you give to other moms trying to juggle the craziness that is life? We could use some advice! Okay, I could use some advice. Well frankly, I could use some advice, too! What is it like? It’s hectic! And there’s not a lot of down time or sleep, especially with our newest addition, Dex, who just turned five months old. As each child has come along, my ability to ask others for help has increased proportionally. Asking for help used to be really hard. I always felt overwhelmed, but I also felt overwhelmed about the prospect of having to find someone to help me, so I tried to do everything alone. For the children, I used to rely on a patchy set of babysitters whom I’d call on an as-needed basis. Finding babysitters whom I trusted to handle Reeve’s medical issues was not easy. I found that the work that went into managing a schedule made up of multiple people, training them, making back-up plans, and dealing with last-minute cancellations was taking up as much time as it was saving. A few months ago, we made the decision to hire a live-in au pair to watch the kids during the day. It was the best decision that we have ever made. An au pair is someone who comes from another country, lives with you, and helps with your children. They truly become a part of your family and they bring with them a rich cultural experience that would be difficult to obtain elsewhere. We absolutely love Cartoon, our au pair from Thailand. Not only is her help ongoing and reliable – she’s a great fit for our family, and all three children love her. As an added bonus – we are all learning to speak Thai! For Reeve’s Tees, in addition to my Super Star Packagers, I lucked out to find an incredibly talented and hard-working assistant to help me with the logistical aspects of the business. So much stress came from a feeling that if I didn’t do something, there was nobody else out there who could. Jenna quickly became my “someone else” who could basically pick up and run where I left off with any given task. For me, just knowing that there was someone who knew everything about the business really offered a sense of relief. Getting help on both fronts – family and business – was essential to making Reeve’s Tees a sustainable business. And funny enough, if you asked me to share advice with a mom trying to juggle work and family, I’d pass along something that I heard from Navy Admiral William H. McRaven during a commencement speech that he gave in 2014. He said to make your bed each morning, and in doing so, you will feel a sense of accomplishment. I took his advice, and on the days where I feel like I’m failing miserably both as a parent and as a business owner, his wisdom has proved invaluable. There is something so refreshing and rewarding about returning to a neatly made bed each night. Great advice! I should work on that... And speaking of a peaceful bed- what is your favorite way to unwind after a long day? On a daily basis, the answer is simple – I sleep! I used to try to read, exercise, or watch TV before bed, but lately, I’ve found out that I have the best “next day” when I’ve gotten as much sleep as possible. I bought a good body pillow, and it has been worth its weight in gold! On a weekly basis, I have a bit of an indulgence – “middle-of-the-mall” massages. I love to go to the mall and get one of those 20-minute seated massages where you put your face in the hole and get a back rub while everyone walks by. I absolutely love those. I can go there and be home in less than an hour, having only spent $20 and feeling completely refreshed. Thank you so much to Shana and to Reeve's Tees for all of the wonderful work that you do! If you'd like to stay in touch with Reeve's Tees, make sure to check out their website right here. Like them on Facebook and don't forget Instagram!